My " Spiritual Bridal-Chamber ". I Am Speaking of the Truth that sometimes hurt. All beings are Sovereign and have free will to express their creative energies in any way they choose; no being has the right to violate and harm others. I belive that "The Middle" spirits ( Souls ); at the end-of-times, ultimately will be offered a special re-constructive process and be transferred to "The Pleroma" and joined with "Aeons" to " The One ". A combine effort of the worst of the worst; of the Archonic spirits. Manifesting themselves as Decans and Zodiac spirits but this time, word for word; as described in "The Tripartite Tractate", see: Noble . See also: Valentinians Bridal-Chamber and/or Gnostic Q, Bridal-Chamber. A 10 years long cycle blended with over 8 years 24x7, dynamic, interactive direct connection of my mind to the spirit world. Consequently, a revelation; how the "Higher and Lower Psychism" spirits, at the same time both; administer, macro and micromanage life in this world. As it is done by a cosmic process, see: Salvation. A disposal of ego that hides behind my "I". There IS only one God, "The Pleroma" "Most Higher Father", see: The Divinity Beyond Being. Also, there are many many ways trying to get closer to "The Pleroma" "Most High Father". We, Us, intelligent beings call it exoteric or esoteric religions. my religion is the only true religion. First of all, keep in mind that; IN THIS WORLD COUNTS ONLY " TRUE GOOD WILL ", THE GOOD KARMA, and it will carry the fruits of its works to the next life.
" Indeed, one must utter a mystery. The Father of everything united with the virgin who came down, and a fire shone for him on that day. He appeared in the great bridal chamber. Therefore his body (i.e. light-body or garment of light) came into being on that very day. It left the bridal chamber as one who came into being from the bridegroom and the bride. As I gather, from reading some books, and watching few videos, similar to, see: Michael Newton Journey of Souls #02 - Case Studies. If the Souls, in the reincarnated body could not control the mind of people associated with evil acts; also depending on the nature of those evil activities, the Soul could be quickly reincarnated back on Earth. They even might select to become a victim for other evil acts in their selected reincarnation. I also happen to believe ( verified by Spirits participating in My Bridal-Chamber ); that at the present time any soul that cannot " handle " present body correctly. Eg; while incarnated experiencing multiple, repetitious instances of killings or suicides. When back at home, this Soul could be offered; whether the soul would submit itself to a special energy refreshing process. A high ratio of good energy particles is mixed with the Soul's negative energy. Eventually good energy particles will prevail and the Soul will become active in reincarnations again. If the Soul does not accept of this special cleaning process. Most of the time; that soul might dwell in self imposed solitude for many, many earthly years. Since in their own nature, the Soul is a friendly, social and joyful intelligent energy; being in a solitude, is a harsh self imposed punishment. Please Note. Throughout reading of the whole page you must keep in mind. "The Most Higher Father" that dwells in " The Pleroma ", aspect A on my chart; did send His own aspect of one of His incomprehensible number of attributes, and did locate it in our Souls; they are known to many as Self/Atman or Christ; in antiquity " Christna " . Also, keep in mind, English is not my native language. From the antiquity there are written text saying same thing; people sense a higher "Being" in themselves, even higher from a Spirit known as the Soul; I and many other people call this "Being" a personal Spirit/Atman which was imparted into our Souls at the time of conception. Since Upper Aeons of " The Pleroma " are Androgynous pairs; opposites in perfect balance with eachother, those are qualities of "The Pleroma". Therefore leading to both, all at the same time; Nothingness and Fullness, " The Perfection ". We are confined within time and space. Therefore we are distinguished from "The Pleroma". Because " The Most Higher Father " of "The Pleroma" Spirit particle; the personal Self/Atman descended into our dimension of time and space; joined Us here on this planet earth within our Souls. We have no language to possibly describe this personal Self/Atman attributes. We cannot speak about any characteristics of any Spirit that came here from "The Pleroma", "The Perfection","The Fullness". Both, at the same time, Nothingness and Fullness. We would be speaking from the ground of our own distinctivenessand concerning our own distinctiveness. I consider our earth organic planet located in a hostile part of inorganic universe. Surrounded on all sides by a negative charge of intelligent dark energies, blended withing the molecular structure of the air we breath. Therefore this hostile intelligent dark energy ability to influence and to lock our minds into our own wills and desires for power, lust and greed is the very cause of all miseries in this world. We need to have strong true goodwill convictions and beliefs in order to be able to minimize it to a very minimum. "Higher and Lower Psychism". Since everything IS energy; consciousness is energy, our thoughts are energy, flesh is multiple crystallized energies but combine together. All of those energies are pingable by Lower-Psychism. I kept hearing those pings, to the point that I thought that my skull will split open on the next ping and much more; for over 8 years. This ping feedback gives the Lower-Psychism a snapshot of the condition of all your energies at any moment. Normal people do not seem to be aware of it. I was permitted to hear this pings and much more because of my "Bridal-Chamber" experience status that lasted for over 8 years. I said it more than once and will say it again; everything IS manifested in "The Bridal-Chamber"
There is much much more to it but I cannot talk about it. I can only give one advise to anybody; have good, true, honest intentions, works; good Karma toward other people. Time-line for spiritual energies that are affecting our behaviour, affecting our subconscious; was tested by me over and over again with up to the minute accuracy for a bit of over 9 years. focus yourself on The Error. A good word to describe archons is, Frenemies. Archons developed a system of hijacking the Homo-Sapiens minds. They can and do expand their own energies into our minds, and so call " freeze " it at a certain level. 1. Hylic personality is a person that me me and only me counts in theirs live. Taking advantage of others in any situation are their goals. Those people love wars and love to invade others so they can satisfied their urge for power. Archons love those people. Guaranteeing their souls reincarnation. 2. Psychic personality is a person that likes company of people similar to their own personalty. They recognize existence of spirit world, they believe in God and like to practice moral standards given to them by their religions. Bible, and other scriptures exoteric or literal translation is theirs standard. This type of people are the most, I would call attacked by the archons. Archons do not have any idea if a soul of this kind of a person will reincarnate in this world. Keep in mind; the Souls have a choice where or whether they should to incarnate or reincarnate. 3. Spiritual or Pneumatic, see: Three Types Of Humans; is a person that most likely will be excentric. This person see this world as a living hell, count me here. Loves God but often wonders about how this God is running this world. Practically lost it"s will to pray. But will pray for deceased people Souls. Have no interest in worldly desires for himself/herself. Most likely the Soul of this Spiritual or Pneumatic person originated in some other dimension with perhaps slightly higher level of consciousness ( so call traveler souls ) and incarnated here in our earthly dimension to gain new experience. Archons will use such a person and manifest themselves in a manner like; bridal-chamber, stigmata, prophets, even a bushman holy man is in this category. In general there are about 2 people out of a 100 in this category. So, do not let archons take over your mind, use your free will to control it. In actuality archons by theirs own nature will try to take possession of the Spiritual people minds, but archons also are willing to reveal some significant truth about the spirit world operation here on this planet earth; in practise how this world operates. The Bridal-Chamber is one of those revelation. Archons know that this person Soul is no longer coming back here to this world. This person Soul joined together with his/her personal Spirit/Atman will go to the level of the highest consciousness. In gnosticism it is called "The Pleroma". The Ladies of "My Spiritual Bridal Chamber". In order, to even start comprehend my Spiritual Bridal-Chamber please read first; the article The Ascent of Mind and the Descent of Wisdom. Starting with Three Stages of Enlightenment. She "The Holy-Ghost" and The Soul with The Self within the Soul ARE The Superstars here; not the catechumen. I said "The Holy-Ghost", that is what I mean; She Is an aspect of an attribute of "The Most High Mother" located on the highest, "The Pleroma"[/url]. "The Holy-Ghost" down here; She IS the manifestation of our Souls, on this planet earth planes. The Bridal-Chamber is a predestined strongly assertive, almost hostile manifestation, or perhaps invitation from the spirit world to introduce behavioral changes into present spiritual beliefs and religions, which are necessary due to the dynamic changes in our world consciousness. It seems they do it every; at the beginning or the end of a decans/zodiac cycle, which is every 2160 years. The zodiac cycle might also be used to; see: Weed Out false religions. See also: Third Testament. It certainly seems to me that archons are using evil to destroy something that had good beginning but turned into evil. This kind of things would be done at the end and at the beginning of the zodiac archons activities. They create new cult or religion at the beginning of the zodiac cycle, and destroy it at the end of the zodiac cycle but only if their own creations turned into evil. Example evil destroing evil would be; Stalin evil destroyed Hitler evil. Also if one wish a bad luck to anybody, be prepared for bad luck to visit you as well. Judging from my spiritual experience. A Bridal-Chamber IS a revelation how the spirits of this world manage this life, in this world. But in duality of Archons. As I sad before our organic earth is located in inorganic part of the universe. On one hand catechumen will receive enlightenment, but at the same time the archons are trying to expand their energies into the catechumen mind in order to take over it. Think about a wild animal setting up a trap. Sometimes this animal makes itself visible in order to instill fear into its target. Then after; will set a trap, so this wild animal can get its victim. Archons work precisely same way. They might get you to pray to them ( pretendig that they are a God ), while at the same time archons are sneaking their own energies on your mind. They do it in a very subtle manner. Use your Free-Will to control your activities toward others. Keep good Karma alive. If interested keep reading. I am certain you will learn something new. Actually modern days scientist string theory and multiverses theory already manifesting God"s works in a more thoughtful way. In antiquity the majority of the esoteric religions knew about it already, but did keep it in secret and sometimes use it for not so noble purpose. As it was applied to me. This is a 10 years long process with over 8 years of long, direct, dynamic 24x7 spirits interaction with the cathecumen. Now, the spirits located below The Pleroma will do everything possible to take over this catechumen mind. So, how it is done. As, I said before. Our earth organic planet is located in a hostile part of inorganic universe. Only our Sun intelligent energies can and do offset those hostile dark energies. From my experience it is only 3 hours out of 24 hours in a day; 12p.m. or noon till 3p.m. that is only 1/8th of a day is clearly most suitable to do our prayers to our creator, without interference from the dark energy spirits. At any other time in a day or night; in varying degrees our minds are attempted to be taken and controlled by the hostile dark energies. Keep in mind they cannot overrule our " Free-Will ". The Bridal-Chamber mystery. It is directed by archons, at the same time in left and right hand manner. Same way, as it was done for thousands of years, an abstraction, a general idea representing the collective aggregation of the numberless spirit-entities; see: Ancient Christna and Cerinthus. I would say that my enlightenment came to me in a manner I call; a lengthly, over 8 years, 24x7 attempt of taking over mind by archonic spirit entities. Then it seems, at a later time whole process of my enlightenment subtlety was transferred to the spirits; according to contexts described by the St. Francis of Assisi,see: Not A True Pastor, But A Destroyer. So it seems, an enlightenment can come, either by a descent or an ascent both at the same time, in a dual state. , see: Three Stages of Enlightenment. Therefore, the Bridal-Chamber in truth, at the same time <u>must</u> be manifested by both; the "Higher and Lower Psychism". We know that we breath approximatively 1.61e23 molecules of air at a time. That is more molecules as the sum of the all visible stars in visible universe; in 1 single breath. Negative energies are offset only by the intelligent light energies emitted by our Sun. So, how those intelligent energies that are blended in our air we breath can and do manifest themselves to Us, the Homo-Sapiens. How an intelligent dark or negatively charge energy could manifested themselves to Us in a positive fashion. They do it in a gradual way; not always clean cut but cults and religions are some of those manifestations. Ancient Hieros-Gamos or modern Bridal-Chamber is one of those ways. So, what is manifested in a Bridal-Chamber. Potent spirits are using our beliefs; sexual energy is bonding Us the eachother the most. So, a Bridal-Chamber is just an allegory to such a bond.Here we have to pay caution. Bonding to a wrong spirit means; guaranteeing a speedy incarnation into a next body. Because those potent spirits have the ability to lock your mind; everybody"s mind into a preset level of your beliefs or behaviour. Use your " Free-Will " to control it. At some point, during my 10 years of this methodically, administered by; similar to the statement, writen by Valentinus in around 140A.D. " The Gospel of Truth ", see: Error, also sometimes known as Archons; in a mystical spiritual clairaudience and clairvoyance known as " The Luminous Epinoia ", at the same time brought to me by both; the "Lower and Higher Psychism". Over a span of time, in my " The Luminous Epinoia " I was involved with 12 female spirits, each of the Ladies in their own turn appeared in my Luminous Epinoia as a Feminine Spirit. Each of my Bridal Chamber Ladies was; unique, full of dignity, able to communicate with me in the language of my prayers, English; distinct, yet modest. Each of those beautiful looking Ladies appeared in my Luminous Epinoia; the face covered with a wedding veil, in full white bridal dress, participated with me each; in a separate Spiritual Bridal-Chamber wedding ceremony which included presence of spiritual witnesses. The character in each and of every Spiritual Bridal Chamber ceremony was such that it contained elements of both; blessing elements and unifying elements. Greatly emphasizing the unifying aspects in each ceremony. Difficult to describe, yet it felt; there was only one Spiritual Bride in all 12 of my Spiritual unity/blessing bridal ceremonies. All of those unity/blessing Spiritual Bridal Chamber ceremonies seems to be conducted like in the heights of heavens. It felt like some sort of vows renewal rituals. On my first Spiritual Bridal Chamber ceremony, my Spiritual-Bride was holding in both of Her hands a circular wreath made of laurel or olive leaves with two ribbons attached to the back of it. At that time I did not have any idea what it meant. It was a feeling of a total, complete oneness. Also, years ago; at that time I did not have any idea what it meant; now, though years after it did happen; the interpersonal relations between myself and the manifested spirits, done with a feeling of a great reverence, should be regarded as similar to, see: Yarek Circumcision. Why 12 Ladies one would ask. It would suggest that the groom is this 13th but in a positive way. Though I think that a superstar here is The Holy-Ghost Herself, hidden as a Soul. In gnosticism She is known as " The Sophia Achamoth ". The Sophia Achamoth is this 13th, the superstar here. The groom in bridal chamber is only the carrier of the spiritual message. Look for the true God withing yourself, manifested by Self/Atman that reside within yourself, within your own Soul. The Sophia Achamoth, The Holy-Ghost down here, on this earth plane; She is an aspect of The Pleroma Most High Mother known in gnosticism as The Pleroma Most High Father's Thought, see: "Ennoia, Silence, Barbelo"
So, as a consequence of my Spiritual Bridal Chamber, as it was manifested to me in 12 separate bridal ceremonies that actually felt as only one ceremony, and took place in my " Luminous Epinoia "; at times, I was called by My Leading Spiritual Bride; my Son, my husband. This manifestation, in a sensible way, of manifesting, in a way; as Mother/Father/Husband/Wife/Son/Daughter in truth, is the only way to do it properly. Meaning; the Soul was joined together with it's own Spirit/Atman while in the flesh, here on this planet earth. Otherwise saying, the Soul did acquired full knowledge, about its own Spirit/Atman existence; while She is incarnated in this flesh, on this planet earth, and voluntary did join that Spirit/Atman to form a unity. This total Soul Consciousness, Self-Awareness produces, allegorize to; in my case, The Son. Manifesting, representing the archetypal masculine and feminine polarities which are the source of created life in total Multiverse. One can find this figure of the Father/Mother/Son-Daughter/Husband-Spouse in the psychologist, Carl Gustav Jung writings, see: Anima and Animus. In the antiquity the same figure of the Father/Mother/Son-Daughter/Husband-Spouse was manifested in "Hieros Gamos" similar to, also see: "The Goddess". This Sonship-Daughtership of the Father/Mother/Son-Daughter/Husband-Spouse in present days, to many is known as our Spiritual-Mother is manifesting of; the Self/Atman/Christ/Elect/DivineSpark etc. ; to others, particularly in antiquity was known as " Christna ". Now this young bride lost it. She is full in love with Her Self/Atman, She will do anything to hold on to Him. But He does not linger. He knows that this is different from the past. He smells Her love, He wants to marry Her. She agree. United together in Bridal-Chamber by The Ruha "The Holy Ghost". Now they wait to be separated from the Ego and the Flesh. This Ego and the Flesh ( me ) knows that his existence on this earth plane is coming to the end. But somehow this Ego and the Flesh is not jealous. He wishes this brand new spiritual couple all the best. But wait again, the archons say, both of you, not so fast we are here. Before you are separated from this flesh we the archons have something to say. And archons start playing theirs, The Mind Games. And this IS the truth. All of it was manifested to me in over of 8 years of my life. We cannot forget that all forms of our, the Homo Sapiens activities forms all of the Karma, see: What is karma?. Therefore sooner or later leading to total redemption. The " Holy-Ghost " Neutrality and Tripartite Aspects of its own "Feminine-Principle", a Nurishing-Preserving Force; see: "Masculine and Feminine". OK. But this is not the end of it. The " Holy-Ghost " Neutrality and Tripartite Aspects of its own "Feminine-Principle", as it was manifested to me in my Spiritual Bridal-Chamber. The meaning of Tripartite Aspects of; Father/Mother/Son-Daughter/Husband-Spouse in my Spiritual Bridal-Chamber. If the lower psychism will take hold of the catechumen; by the end of his/her Spiritual Bridal-Chamber; he/she will become a hylic type of person, a leader; eg. a priest/priestess in an occult, see: Three Types of Humans, see also: "Lower and Higher Psychism"
If the higher psychism will get hold of the catechumen; by the end of his/her Spiritual Bridal-Chamber; he/she will become a "Son/Daughter" a psychic type of a person, a leader in his/her exoteric religion; eg. a faithful and dedicated catholic priest/priestess. If the catechumen Soul and his/her own Self/Atman/Christ/Elect/DivineSpark etc. will get upper hand on the catechumen; by the end of his/her Spiritual Bridal-Chamber; he/she will become Son-Daughter/Husband-Spouse; he/she will become the so call Spiritual/Pneumatic type of a person. 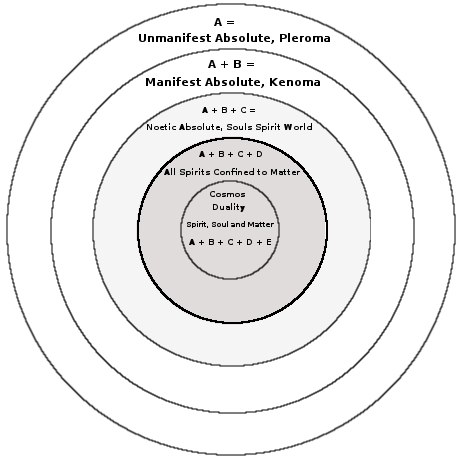 The Spiritual/Pneumatic type of a person, this Son-Daughter/Husband-Spouse; He/She will become involved much deeper, in the redemptive process of all Souls and Spirits below the Pleroma; including all the so call exoteric and esoteric Gods, as well The Sophia-Achamoth Herself. Otherwise saying, all existance located below " The Pleroma ", aspect A on my chart,. Keep in mind that for the catechumen to achieve the final spiritual state, the catechumen MUST past through all 3 stages of his/her Spiritual Bridal-Chamber experience. So from the fires of the "Bridal-Chamber" and from fighting His personal armageddon battle against archons invasion of his mind, for over 8 years; emerge new birth, a new bird know as Phoenix which according to some traditions will rule for next 1000 years and beyond. But this newborn Phoenix also supports the works of a 2000 years old Phoenix.
" Live Your Truth. Do not seek, or do not take advantage of eachother; always seek mutual consent with one another... "
So, those Decans and Zodiac spirits instilled into Us the beliefs that 36 Decan stars and 12 zodiac constellations have some sort of a Divine purpose. See my blog: Decan Spirits Activities. Actually archons manifested this Bridal-Chamber the way archons do those things. They did guide my thoughts toward incarnation and reincarnation of which I did not have any idea; at that time, that such a thing existed. Then seems from one thought to the other, the knowladge of the Pleroma and other things came to my mind. Archons vouchsafe for the existence of The Pleroma and The Kenoma, also about the existence of The Pleroma Most High Father as well. I did test them countless times on those issues. Consequently, after over 8 years of above, including aspects of sever tribulation, or perhaps an attempt of taking over my mind lead me to the unification of my Soul with The Self; an aspect of an attribute of The Spirit of " The Pleroma Most High Father ", from the time of antiquity was know as one succeed in arriving at " The Christ-Consciousness ". It seems also that after 8 years of above the only way I can contact the spirit world by asking them first. Otherwise saying they cannot connect to me unless I ask for it myself. Archons, from the eternity raise and fall Empires, create and destroy cults and religions, create new gods and destroy old gods, or rather give the same gods new names. A Bridal-Chamber is one of archons method to establish a new religion or modify an old religion; though, always based on some sort of a blend based on; new and old beliefs, or perhaps on an old religion. It actually looks that archons are trying to come back into to very basic very old believes: worship the spirit world old ways where fire; not the sun was a divine object of worship. I tested it many many times, all kinds of different ways: those spirits could only communicate with me in language of my prayers. Archons can and do hijack our thoughts. They easily can make; just about anyone, feel good or bad about their own thoughts, believes and convictions. Therefore, be aware about your activities directed toward others. Keep up a " True Good Will "; good Karma toward others.
" The Feminine Principle ", a Nurishing-Preserving Force, see: Masculine and Feminine is; She is a Mother, She loves life in the living; but She will become neutral to the child that became adult. She will hand over Her adult child to Her Masculine-Principle; so He can form Her adult child, according to this adult child predestined Karma.
" One of the cardinal functions of a Sat Guru is to absolve through his own grace, sympathy and suffering, the accumulated karma of the spiritual aspirant ". I categorically disagree with this concept. And, our sun shining on Us, friendly energies, symbolizing, and actively participating in helping Us to sustain a positive nature of interacting with other a species. What I did experience during last 10 years, archons showmanship, interacting with living a species, me. Countless times, for several years I noticed that our sun energy dilute dark energy to a point that those archonic intelligent energies act sometimes almost in a semi-divine manner. This I described way below. Our planet earth is macro and micro manage by spirits known, and located in; The Hebdomad, aspect " E " on the chart located at the left side, and seen that way by me, Basilideans, Sethian Gnosticism and some others, and call them the Archons, or archons section on my, see: Higher and Lower Psychism. Denying Soul's ability to incarnate and reincarnate, could motivate a medium or a mediator and <u>MUST</u> drawn into the currents of its thoughts, when as it were by proxy the "Elementary", the "Shell", the "Spook" in order to impose on us theirs will. For almost 10 years, they keep trying this method on me. First using your present religious believes, they will direct your mind into deeper meaning of that religion. So, since you want to know more, you will start searching. You will be always able to find something different about your present believes. The worst time was dusk till down ( notice here, the lack of our sun energies, that do counter archons energies ), between 6pm and 9pm they kept sending powerful pin(s) of theirs energies into my head. If they did encounter any of my spiritual thoughts energies, they did try attach their energies to it, and did try to expand them in order to take over my thoughts and mind energies, and amplify it. If the archons energy could not find any of my spiritual thoughts energies; they did exit their energies in the back of my head but with a loud crack. It felt like my skull just cracked wide open. Though at a later time, I felt very little pain, mostly discomfort. The "Higher Psychism" or Mediatorship; could be Divine, or act as a divinity, intelligently applied, most of the time positive; by way of the "Elementary", the "Shell", the "Spook" will do positive work, good karma; like, to motivate you to be compassionate, loving, forgiving etc. Keep in mind that a mediator, could also act as a medium, in an archonic like manner, for its own reasons, think (assessing, testing). The "Lower Psychism" or Mediumship From my experience. In principal they are not evil; lack of light, blind, animal like, lack of love. They are extremely good in extracting our own previously hidden thoughts for lust and desire for power. The "Lower Psychism", by way of the "Elementary", the "Shell", the "Spook" could take a negative approach. It could impart into your mind, using your own previously hidden thoughts for lust and desire for power in such a way as to, it would, affect your Soul through your flesh, by instilling in your mind a thought of suicide, narcissism, extreme selfishness, being angry, reckoning it all together; bad karma, like taking advantage of people when they are the most vulnerable. Therefore guaranteeing your Soul reincarnation. Eg. Lower Psychism most favored way is to convinced somebody that; God does not love you, God hates the way you conduct your life. Therefore you should kill yourself, so your soul can start all over again. Do not listening, God always loves you, and never ever wish for any sacrifices. Sacrificing is archons idea. It is, the "Lower Psychism", the Mediumship I consider as the most interacting spirits with the "Homo Sapiens", Us, see: Archons, similar to, as in Pistis Sophia, or archons section on my, see: Higher and Lower Psychism. He always loves you, does not need any of your sacrifices. He wants you only to have a " true good will ", good karma toward others. Those are the workings of the cyborg like mentality of archons. The Archons are not people, they"re spirits. Everything in this World of Forms has a cause and an effect. You know "The butterfly effect? The Archons are the butterfly. They"re the root causes of all of the wretched little circumstances that snowball into the terrible little events that evolve into the nasty big events that are completely out of your control. Again, they're in charge of anything that happens that is out of your control. This includes some things that are good and some things that make you happy. They serve to divide us, in insidious ways. They"re the little jerks who sit on your shoulder and make you churn out corporate jargon, and use words that are nouns as verbs in order to sound important, and distract you from doing the things that you find fulfilling. They"re also the little bastards who hum through the air pushing you into things, or stealing your items, or pulling the wool over your eyes about your relationships with other people. Since, "Lower-Psychism" knows that, for the incarnated Souls " true good will ", good Karma, is the only thing that counts in this life. New cults and religions are created by the "Lower-Psychism", using Our previous thoughts and believes, modified and adopted to our present times, with new names for Gods, new names for Spirits, and so on. Please note, that the "Lower Psychism". They are much much more sensitive to any energy change, on any energy level. So, if the cosmic energy level is of a negative state, they could act upon Us, negatively. And, opposite. If the cosmic energy level is of a positive state, they could act upon Us, semi-positively. Continue of an attempt of the taking over, by: Archons. I will grade macro-micro energies that we and spirits confined to matter are exposed to 24x7; extremely vicious, vicious, controlling. So, there I go: a time-line for spiritual energies, that are affecting our behaviour on this planet earth. 1. Extremely vicious, in a hidden and treacherous way, starts at 6 minutes past 12am. or midnight till 6 minutes past 3am. If you can. Do not pray at those hours. This spirit means corruption. This spirit is a spiritual beast. If you pray at night hours, this spirit will lock his energy into your thought energies and hold you like that for the rest of the day or forever, if you let it. Sometime in the afternoon, most likely after sundown, this midnight spirit will try to reverse your thoughts like; its OK to do things that your morals tell you not to do. Otherwise saying, this spirit is trying to push you to act against your own morals. This midnight spirit IS the worst of any evil spirits I ever did encounter, in all of my over 8 years direct contact with this spirit, in all of my spiritual experience. Once this midnight spirit get hold of you it is very difficult to get rid of it. If you do it on your own. It will take years of hard work and a very strong free-will in order just to keep this spirit not manifesting itself. Only your strong Free-Will can defeat it. Otherwise, archons, the "Lower Psychism" will expand their energies within your prayers energies, and WILL gradually take over your mind. 2. Same spirit as above but using weaker energies. Very controlling, starts at 6 minutes past 3am. till 6 minutes past 9am. If you pray; watch for countering thoughts latter on in the afternoon, try to keep good karma alive. 3. Mildly controlling, starts at 6 minutes past 9am. till 6 minutes before 12pm or noon. Most of the time female spirits will manifest themselves at this time. No exceptions. 4. Practically no controlling, starts at 6 minutes past 12pm or noon till 6 minutes before 3pm. Perfect time for thanksgiving prayers. 5. Wow, this period I consider vicious, in a gradual way, starts at 6 minutes past 3pm. till 6 minutes befor 12am. or midnight. In particular at 8:30pm. is just terrible. The spirits will try to take over your mind anyway possible. Using any tricks, deceptions etc. What I noticed though, that archons energies are much much weaker when the sun is up. The brighter the sky is, while the sun is up high, archons energy is weak. Correction, all spirits bounded up with matter are also under influence of 36 different micro spiritual energy levels throughout 24x7. I mean Spirits located <u>below</u> the so call portal(s), tunnel(s); located between our material cosmic dimension and my "The Middle", the " C " on my chart. So, what is conceived on earth stays on earth. So, it seems that, no matter what religion you practice, it is the " TRUE GOOD WILL ", THE GOOD KARMA in present live, will set you up for a live, you WILL have in next incarnation. Whenever you are feeling angry, feel like cursing, swearing, upset, quarrelsome, enraged; combine with bad action, bad karma. Blame it on the "Lower Psychism", or maybe your soul think that is on a vacation, and/or you have weak free will. It IS the "Lower Psychism" way to ensured that your soul will be incarnated again, see: Archons. This law supersedes even the fundamental law of Karma. For " true good will " is intrinsically good; its value is wholly self-contained and utterly independent of its external relations. Therefore, " true good will " is the supreme potential of balance. The purpose of Karma is to attain harmony. If you throw a rock into a still pond you will disturb the harmony of that pond, you are the cause. The effect is a splash and series of waves on the surface of water that flows back and forth until the harmony is restored. Consequently, your incompatible actions with " true good will " will flow into the Multiverse and eventually will fell back on you, lifetime after life time, until your own " true good will " is restored. To fully describe my spiritual experience. It would take several hundred pages. Sorry, it would have to be condensed into one page. Also, English is not my native language. It is known that archons can control animals. As, a consequence of it; if I may say so, the domestic animals where involved in my spiritual journey as well. Take my word for it, nothing else counts but what I just mention above, " the true good will " toward others. My Bridal-Chamber experience was brought to me by 3 different type of spirits. 1. Mediatorship; Divine, controlled, intelligently applied, positive, the "Higher Psychism". Little bit over 10 years ago, all over sudden I had an urge to go to the church with my wife. She was very surprised when I went with her to the church. All of my spiritual experience, described below lasted almost 10 years. Our body muscles, when in motion generates electricity. So they use this electrical signal to connect, also they blend themselves into energy of prayers, muscles, nerves etc. Because, nothing else but " true good will ", good karma counts, and in this connection process they are using, previously mention; a mediumship or a mediator which MUST drawn into the currents of its thoughts, when as it were by proxy the "Elementary", the "Shell", the "Spook" in order to impose on us theirs will. Well, in order that, those earth confined spirits could not take over human mind; and since the " true good will ", good karma, and a very very strong will is the only thing that counts in this world. I do advise. Again as I said above. I consider our earth organic planet located in a hostile part of inorganic universe. Surrounded on all sides by a negative charge of intelligent dark energies, blended withing the molecular structure of the air we breath. As I mention before, I am a very skeptical person. So, the spirit world had pull all the stops to deliver theirs message. Here it is the spirit world delivery of of this 2 step forward 1 step back of my spiritual experience. If a mediumship or a mediator lost connection with me, say like after I went and have a nap. Soon I was awaken, a very powerful 3 pulses sound buzzed in my ears, followed by a powerful ping sound. This ping energy. It felt like a grappling hook, or energy looking for an opening. It was very very powerful. Only my strong will did resist this activities, I mean held it back. At that time I thought it was an attempt to takeover over my mind. That is why I know, that my Soul and the Spirit located within my Soul helped me to survive this ordeal. Actually " Lower Psychism " exploit, our own, the homo sapience drive, urge, lust for power. We are our own enemies. Lust for power, the ego that hides behind "I" has no place in a " true good will ", good karma environment.
" So too can the Archon appear as that which is Holy, even unto taking the guise of Sophia or the Christos but never both at one time in the Bridal Chamber, for that is a Mystery that the Archons cannot ape. " A Bridal-Chamber, is all about just that. She manifest the existence of The Masculine-Principle the Spirit, and associate that Spirit connection, and relation with that Spirit as; a partnership with Herself. In The Bridal-Chamber She, The Ruach, The Holy-Ghost, the gnostic Protennoia, see: Trimorphic Protennoia; in the first place MUST be regarded as a Mother, and when She manifest Herself as a spouse in a Briadal-Chamber, She should be regarded as such, with respect to The Spirit located within The Soul. The technique of the archonic attempt of taking over, or making it look like the purging is needed; implemented by: The Archons. Though it seems, that at some point the mediator of the " Higher Psychism " perhaps playing a role of a mediumship of the " Lower Psychism " was also attempting to take over my mind. It looks like all of that spiritual experience was tailored to my own personality. Here I would remind the reader. I consider our earth organic planet located in a hostile part of inorganic universe. Therefore, the Bridal-Chamber in truth, all at the same time <u>must</u> be manifested by both; the "Higher and Lower Psychism". I think, because this world IS designated. I call it, as I see it; the nature dominates, always take advantage whenever you can. This is O.K. for animals but a no no for humans. I have an impression, that a species like Us, at first thought should stay just that a species but the Souls want Us, so called a species, acquire a higher status, closer to the Soul's status. That way the Souls could express themselfs on a higher level of intelligence in this material world. You need to keep in mind. That Lower Psychism, see: "Higher and Lower Psychism" act as proxy for the activities of the Higher Psychism. Otherwise saying Lower Psychism becomes a proxy for the activities of the Higher Psychism without even knowing it. Looking at it, few years after it did occurred. I am certain the part below might be a part of some sort of a cleansing, purging, perhaps purifying process. The Lower-Psychism spirits were anxious to enrage me, on purpose, and very very quickly, too quickly. I also, did sense, in theirs activities a some sort of urgency and one of a purpose. It appeared, reading many books and articles on the subject of the bridal-chamber; that it was a purpose, perhaps having aspects of some sort of; it could be of a divine providence. They were steaming to this rather quickly. Now I can see it clearly. The whole process of this manifestation took almost 10 years with over 8 years of direct interaction. So a time factor was here at a play. And I am a man of rather advanced age. Those spirits know that they cannot corrupt a mind of a catechumen who did enter the Bridal-Chamber. But they did try very hard for what they were doing. A person like this would rather gladly die but it would not do anything evil to anybody or to himself. I call it the "Higher and Lower Psychism" mind games. The statements below are not intended as a retaliation toward archons but as a statement of facts what in reality did happen to me,or rather what archons did to me. First of all one needs to know that from the time of the antiquity archons did hack into the homo sapiens nervous system. They can impede our nervouse system normal operation. Archons can inject their energies into our nervouse system causing Us great pain and misery for years; sometimes even death. In a moment right after that he asked me again whispering, " ... would you kill yourself for me ... ". I yell at him " go to hell devil ". In actuality using this kind of mind games, archons want Us to keep our focus on them. This is exactly how archons are capable to hijack our thoughts energies and expand their energies into our thoughts energies. They want Us to think abut them; good or bad, at all times. Few moments later he said, " ... do something atrocious ... ". I told him again " go to hell devil ". I was enrage. He was aggressive. I called him all kinds of nasty names. That was the only way I could slow him down. Particularity, on after awaking from a snooze or a night sleep my head experienced powerful, wicked pings. The energy of those skull splitting pings entered my frontal lob then exited in the back of my head with a loud crack. It felt like my head temples extended outward. After about 2 or 3 years of this; those pings continued but much milder, all the way till the end of my 8 years direct interacting with Higher and Lower Psychism. Those wicked pings in my head where much stronger after the sun went down or if I attempted however small of a prayer. Therefore I always tried to go to sleep early. My leg muscles for weeks at a time and muscles in general start having terrible cramps, and I felt an energy of a spirit is doing it. My whole body developed powerful jerks, to the point that for a short instance my whole body lifted from the bed. My body became stiff then relaxed, over and over again. My limbs had similar jerks for long time. This lasted way to long. Hard to estimate it, it gradually went away; perhaps after 2 or 3 years. Even now after 8 years, my limbs have a powerful energies entering them. I did got use to all of it. While driving, I felt a force on my arm to try push me off the road into a river, while having 2 very religious women in my car. While I was sleeping in the same room with my wife, I started having, hostile flush like thoughts toward my wife. I moved to a spare bedroom. That move fixed it. Well now, what I have to say, it might sound strange to some readers but the Spirits I was in conversation with, are confined to matter. But the same spirits manifested to me the true; theirs workings on this planet earth. Theirs administration of good and bad karma to so call " homo sapiens ", Us. "Lower Psychism" can and do expand their thought energies into mind of others, in such a way, that a person think, that thoughts he is thinking now, are his own thoughts and will speak it out. Only a person with a high level of consciousness, self awareness can detect it. Trust me, "Lower Psychism", they tried that on me many many times. At first I did fell into it, then I learned and still somehow learning how to detect "Lower Psychism" energies in my thoughts. Watch for sudden changes of your moods, and your mind thoughts without reason. I did experience same attacks from them every day, precisely, to the minute, exactly the same way for several years. I could tell what is the hour of the day, within 60 min. Just by observing how those energies are affecting me. So, I conclude. "Lower Psychism" is responsible for ALL, please read it ALL evil acts; every act of rage, violence, war, suicide, world wide mind control. Show me your religion ceremonies. I will tell you what kind of spirit controls it, see: Archons. Negative "Lower Psychism" instill into people minds, the negative Karma; while "Higher Psychism" does it opposite, instill into people minds, " true good will ", good Karma. From here on it is your the " free will ", I rather would call it " a free choice " that takes over. Having said that, at every new zodiac, which is every 2160 years, the Spirit world instill into Us new religions, new cults and new names for a God or Gods. Redemption from future cycle of reincarnation should be the primary target of all religions and cults. All-thought though, a belief in salvation of our Souls will make simple people act in " true good will ", good Karma.
" True good will ", good Karma would assure our Soul redemption from future cycle of reincarnation. So, the spirits that micromanage this planet earth manifest themselves to Us according to our beliefs, to each its own. In most versions of the Gnostic mythos, it is Sophia who brings about this instability in the Pleroma, in turn bringing about the creation of materiality. According to some Gnostic texts, the crisis occurs as a result of Sophia trying to emanate without her syzygy or, in another tradition, because she tries to breach the barrier between herself and the unknowable Bythos. After cataclysmically falling from the Pleroma, Sophia's fear and anguish of losing her life (just as she lost the light of the One) causes confusion and longing to return to it. Because of these longings, matter (Greek: hyl, ) and soul (Greek: psych, ) accidentally come into existence. The creation of the Demiurge (also known as Yaldabaoth, "Son of Chaos") is also a mistake made during this exile. The Demiurge proceeds to create the physical world in which we live, ignorant of Sophia, who nevertheless manages to infuse some spiritual spark or pneuma into his creation.Almost all Gnostic systems of the Syrian or Egyptian type taught that the universe began with an original, unknowable God, referred to as the Parent or Bythos, or as the Monad by Monoimus. From this initial unitary beginning, the One spontaneously emanated further Aeons, being pairs of progressively 'lesser' beings in sequence. Together with the source from which they emanate they form the Pleroma, or fullness, of God, and thus should not be seen as distinct from the divine, but symbolic abstractions of the divine nature. The transition from the immaterial to the material, from the noumenal to the sensible, is brought about by a flaw, or a passion, or a sin, in one of the Aeons. See also: My Pleroma-Multiverse for Cosmos Duality: A+B+C+D: Home to aspect D: Well, we need to look into Valentinianism, a protology philosophy around year 140 AD, teaches that; the Pleroma's Anthropos and Ecclesia became parents to six pairs of Masculine-Feminine Aeons; means the youngest Aeon known as The Sophia-Wisdom would become a 12th Eaon. In principle. In Valentinianism and in the Sethianism She IS The Mother of everything below The Pleroma. Her action stemmed from a pure love to The Most High Father, and attempting to see Her Father without participation of Her consort; which could be seen as an attempt to impose Her Feminine-Principle over Her consort Masculine-Principle was a no no; She could as well be reabsorbed into pure light of The Most High Father. Therefore, Her nevertheless noble attempt gave birth to unwanted inteligent energies. Those energies were immediately removed and relocated by The Most High Father to an empty space below The Pleroma known as The Kenoma. Keep in mind that Pleroma's nature IS regarded as a Masculine-Principle. In all of The Multiverses; only The Pleroma " Most High Father " can step out from His Androgyne form whenever He wishes so. All other Spiritual Entities, in whatever they do; must have consent of their equal but oposite half, see: Consorts. Note here; the manifestation of The Most High Father of love to everything that came to existence; He could destroy those unwanted energies but He did not destroy them. As, a consequence of those activities much later in time we had the so called " Big-Bang ". Pleroma's Sophia-Wisdom daughter, known as The Sophia-Achamoth was put on charge, on management of The Kenoma and everything else below The Kenoma. Therefore, that makes Her a thirteenth Aeon but She dwells one level below The Pleroma known as The Kenoma, in some religions known as eight level but in the Lower Ogdoad ; She works extremely hard to fix the prior error, strive to achieve redemption of all the Spirits that either, descended or came to an existence below The Pleroma. It seems to me, the pure sound that, creates all of the energies, is The Most High Father's " Feminine-Principle " that animates whole Multiverse, including, see: " The All " in The Pleroma. Keep in mind that a spirit can manifest itself as a " Feminine Principle " or a " Masculine Principle ". This, my mystical spiritual journey was not just a flick of imagination or something similar. It was a well organized, methodically designed 2 steps forward 1 step back teaching lesson on the part of the ruling spirits of this world that do micromanage this planet Earth, teaching me what this live is all about. They ARE the ruling spirits of this world that do micromanage life on this planet earth. They did manifest it to me how they do it. Overcoming the difficulties in our lives here on this planet earth, will advance Souls consciousness needed for the future reincarnations, till the time the Soul acquire a state of nirvana; a state of freedom from future reincarnations. In my opinion " Bridal Chamber " allegorize to; that in spirit world ]ALL spiritual beings good or bad as we see it, are androgynous; a spiritual being that is singular but possesses both " Feminine Principle " and " Masculine Principal ". Read more on " Bridal-Chamber ", Bridal-Chamber. Our institution of marriage here on this planet earth symbolize a unity between " Masculine Principle " and " Feminine Principle ". The polygamous marriages symbolize the " Feminine Principle " as a common bonding principal in visible and non visible Multiverse. In our earthly life is the father that is a form giver. That is why so called " Bridal Chamber " implies intimate overtones in its manifestation. That would suggest a relation, of a " Feminine Principle " managing this planet earth; a way of manifesting herself to the catechumen Soul. This means to me, that She as a " Feminine Principle " focuses herself on men. And, Her opposite polarity " Masculine Principle " focuses himself on women. Therefore, this aka husband-wife catechumen intimacy, since time immemorial is known as " Bridal-Chamber "; allegorize, refer to the God's the Creator creative energies active in the whole Multiverse. Meaning that " Masculine Principle " and " Feminine Principle " in agreement with each other run whole visible and non visible Multiverse; according to Local Consciousness, Local Potentialities and Local Possibilities which we have a hard time to comprehend. Revelation 22:17: "The Spirit and the Bride say, "Come." And let him who hears say, "Come." And let him who is thirsty come, let him who desires take the water of life without price. I do not believe in our Souls salvation in lieu of our Souls redemption from reincarnation. I do not believe of bodily resurrection. I despise this material world that I live in and call it " Hell ". I support only the " true good will ", good Karma principal. So, what did I learn from this 10 years push pull spiritual experience. Prayers were only needed, necessary in the first part of of my spiritual experience. The more I was praying, the more archons were trying to expand their energies into my mind;I mean, archons did try much harder to take over of my mind, almost to the point; if arrchons would try it any harder I would certainly become unconscious or perhaps even die from their attacks. I was slowly freed from this spiritual hold of archons. It was not easy. Previously described 10 levels of spiritual energy tried to take hold of me many many times. My strong free will, with the help from my Soul, and the Spirit located within my Soul, brought it to the end. No matter whether it was or is a cyvilian or ecclesiastical organization. The ancient Babylonian energy, will pervert any of the said organizations intentions into an evil type of activities like; wars, blood sacrifices, propagating revenge, fear and suffering etc. If the Souls start refusing incarnating on our earth. Therefore, stop importing good, loving energy to this planet earth; this earth would become animal like, dog eat dog, beastie, barren, bleak and lifeless. A loving Soul consciousness would vanish from this earth.